Yum Yum Red Carpet | Alley Cats Retired Figurines | One Price Low Flat Shipping! From the Alley Cats Red Carpet Collection by Margaret Le Van, Yum Yum. Made of hand-painted resin. Measures 7.5" tall. Manufactured by Artisan Flair, Inc. 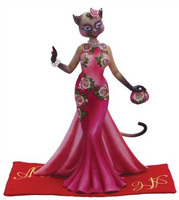 This rare retired alley cat figurine is featured wearing a glamorous magenta colored evening dress adorned with floral accents, along with a pink rose in her hair. To finish off her outfit, she has on a pearl bracelet and is holding a small purse that is the same pattern as her gown. Great Gift, Great Margaret Le Van Collectible. Brand new in original packaging.